Can We Have Civilized Conversations about Touchy Science Policy Issues? El Santuariò de Chimayó in New Mexico is a place of pilgrimages. Scores visit the little adobe church daily, while thousands walk miles to worship there on Good Friday. Many come seeking a cure for their afflictions, scooping from a small pit in the church floor a reddish soil that they rub on afflicted areas of their bodies or even sprinkle on their food or brew in tea. 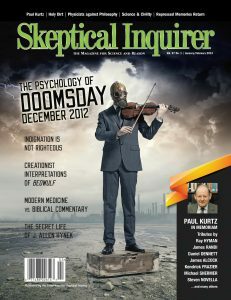 Cognitive science research on belief in the 2012 “apocalypse” demonstrates that dissociative processes contribute directly to this belief through reduction of the “feature-intensive” cognitive processing that would engender appropriate skepticism. There is no field of inquiry that young-Earth creationists can’t distort. In the area of literary and linguistic studies, they misinterpret, misrepresent, and mistranslate Beowulf to fit their agenda. A review of Solving the Communion Enigma: What Is to Come by Whitley Strieber.